This add-on does NOT decrypt viewstate. It means it does not work on encrypted viewstate. This add-on does NOT perform deserialization of viewstate. It was just designed to give a sneak-peek of whats in the viewstate. This information could be useful to developers and testers of web applications. The contents of ViewState are serialized using 'LOSFormatter' which performs ASCII serialization and encodes the output using Base64 encoding. 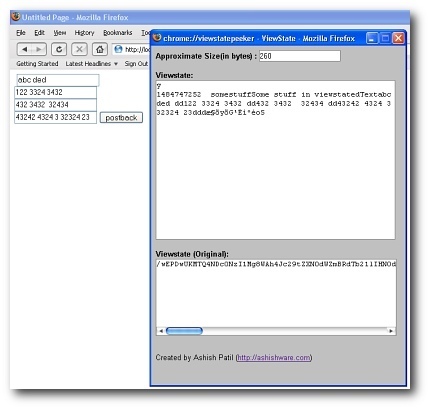 This add-on merely performs a Base64 decoding and shows the content of viewstate. THIS SOFTWARE IS PROVIDED "AS IS", WITHOUT WARRANTIES OF ANY KIND. THE AUTHOR IS IN NO WAY RESPONSIBLE FOR ANY DAMAGE CAUSED BY INSTALLATION AND/OR USE OF THIS SOFTWARE. THIS SOFTWARE IS EXPERIMENTAL WORK AND NOT THROUGHLY TESTED. USE IT AT YOUR OWN RISK. 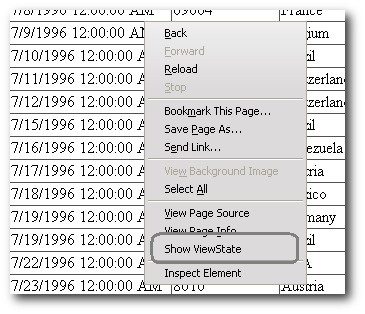 Context menu showing 'Show ViewState' item. 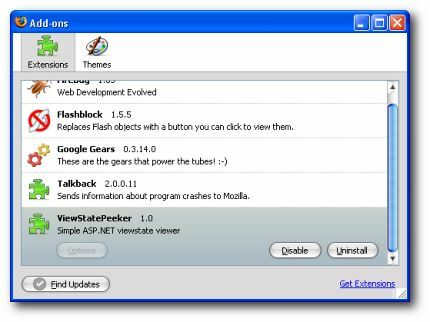 Great tutorial on writing Add-ons for FireFox. Nice tutorial on packing Add-ons.